I have lived in 3 cities here in Florida, and while I haven’t given up here in Jacksonville just yet, my searches in Pensacola and the Tampa Bay area came up beerless. I am on a quest to find the legendary Japanese beer Yebisu. It has been rated Japan’s number one beer for awhile now. Sure, I can probably have it shipped to me, but I like to explore and find new places that I would otherwise not have found. 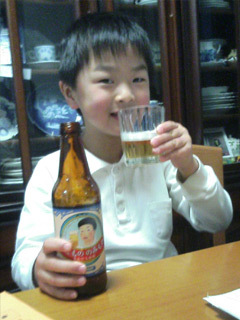 So far I have tried various Kirin Ichiban, Sapporo, and Asahi versions which seem to be easy to get anywhere you live. I do perfer the Asahi with Kirin Ichiban a very close second. I’m not much of a beer drinker, but if I can’t get a top shelf Long Island, I will drink a light beer. Gaijin Tonic‘s a great blog about beer drinking in Japan that you may want to check out. If you were wondering, no I don’t promote kids drinking alcohol. What’s that picture from then? It’s just one of the top ten weird and bizarre Japanese drinks. What’s your favorite import beer from Japan or elsewhere?